BPMessentials is pleased to announce a partnership with Signavio, a cloud-based process modeling tool and team repository. Our famous BPMN Method and Style training will be offered live-online using Signavio on January 8-10 from 8am to 1pm each day US Eastern Time, or 2pm to 7pm each day in Europe (CET). No previous modeling experience is required, and you will come out of the training able to construct BPMN models that are not only correct but clear, consistent, and complete. The class includes hands-on exercises in class using Signavio, as well as post-class certification. Signavio supports the Method and Style validation rules in the editor, so we can offer the same certification procedures as we have in the past with Process Modeler for Visio. To support the certification, 60-day use of the Signavio tool is included in the cost of the class. We have trained over 1500 people worldwide on the Method and Style approach to BPMN, and the list of certified students is continually growing. Check out the syllabus on the bpmessentials.com website. BPMN looks a lot like traditional flowcharting, but if you really want to make your models sharable across the organization, you need a bit of training. You’ll learn the shapes and symbols that are important – it’s really a small subset of the total element set – and when and how to use each one. 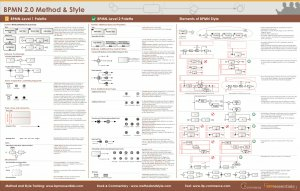 You’ll learn the Method – a cookbook procedure for going from a blank page to a complete process model, with a consistent structure in which the process logic is unambiguous from the printed diagram alone. And you’ll learn about BPMN Style, simple rules of composition and usage reinforced by validation in the tool. It’s all baked into the training, delivered live, interactively, over the web. You’ll access the training in a browser window and perform in-class exercises using Signavio in a second window. Many consultants are getting into the BPMN training business, but why learn BPMN from a guy who read a book when you can learn it from the guy that wrote the book? The standard price is $1095 (quantity 1), $995 ea (quantity 5), or $895 (quantity 10+). But if you contact Signavio, you can get a coupon that drops the price to $695, including certification, if you register by December 31. Click here for more information about the class. When you’re ready, click here to register by credit card, or contact bruce@brsilver.com to register by PO.